Hi! We're Sarah, Emma, and Kaitlynn. Owned by two women (Sarah and Emma), and their dogs (Kyrah, Cricket, Max, Sookie, and Mufasa). 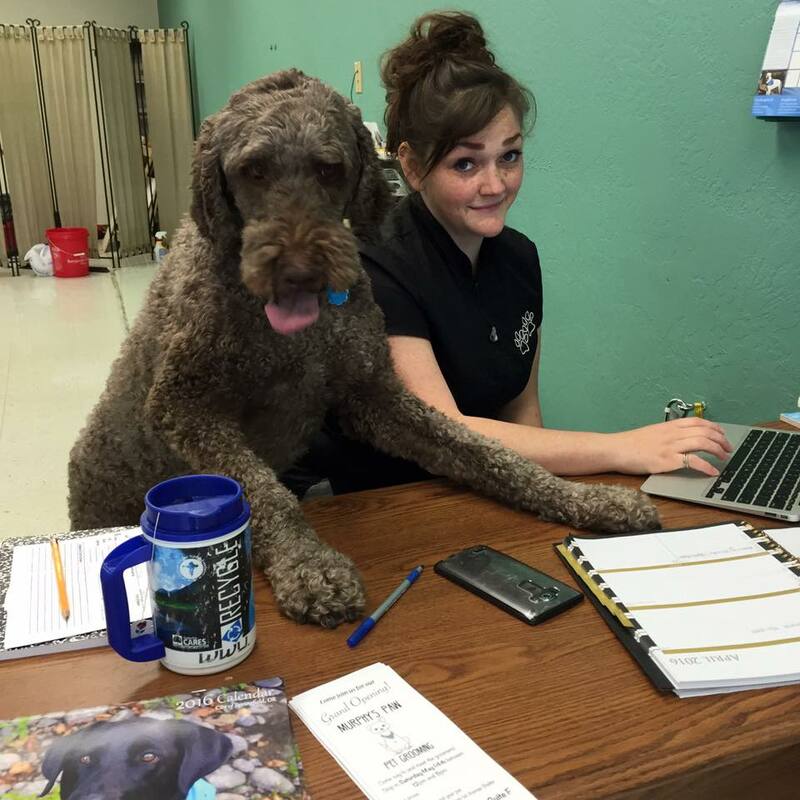 Murphy's Paw is a locally-owned small business that you can count on for excellent pet-grooming services. Sarah has been grooming for 12 years. When she is not at the grooming salon you can most likely fine her tending to her two dogs, two cats, or three horses. Sarah has a keen eye for detail, and is a superb problem solver. This skill has made her quite used to hearing Kaitlynn and Emma utter the sentence "Hey Sarah, can you come look at this?". Sarah is not currently excepting new clients. Emma has been an animal lover her whole life. Having grown up with both pet and working dogs in her home, as well as fish, gerbils, snakes, turtles, and guinea pigs. She started working with animals in 2007, when she worked in the kennels at the Greenhill Humane Society. At this time she developed an interest in, and studied canine behavior and psychology. In 2010, she dove head first into her grooming career. Over the years she has attended expos and seminars to continuously expand her knowledge of canine physiology, behavior, and the grooming industry. She has a soft spot for senior and disabled pets, having provided hospice foster care for two terminally ill senior dogs. Emma is not currently excepting new clients. Kaitlynn is the passionate mother of two beautiful dogs. The love she has for these two dogs is rivaled only by her year round passion for Halloween. She has been in the grooming field since 2009. Tami is Murphy's newest addition. She brings 17 years of grooming experience with her, having learned to groom while apprenticing under talented show groomers in California. These groomers showed springer spaniels, corgies, keri blue terriers, and poodles. Tami has shared custody of her blue nose pit bull, whom she loves dearly; she also has a chihuahua, and is regularly seen surrounded by the dogs that she boards. Freyja is currently interning at Murphy's Paw, as she develops her grooming abitities. While she has yet to use a pair of scissors, she has proven very skilled at finding dogs, in even the most complicated picture books.